As people of Quang Tri Province joined everyone in Vietnam celebrating the New Year, three hill tribe families in Dakrong District enjoyed an especially joyful holiday. They were provided goats from Project RENEW to raise and generate income for their children. These goats were made possible thanks to a second donation made to Project RENEW in 2015 by members of the Unlimited Possibilities (UP), a small organization in the U.S.
Ho Thi Duyen, born in 1977, was permanently injured in a UXO explosion in 1992. 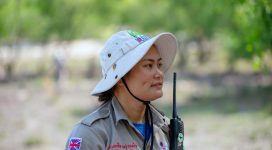 She was hoeing her family’s rice field when she hit a piece of UXO. The accident claimed her right hand and one eye. She was unconscious from the blast and never knew what the ordnance was. Now a mother of four children, ages one month to 12 years old, Duyen doesn’t have a job. Her husband earns the family’s small cash income through slash-and-burn farming. This family of six live in a small, wooden stilt house in Cat Village of Dakrong, one of the poorest districts in Vietnam. When RENEW and the Dakrong District’s Red Cross Association announced that the family would receive goats to tend and raise, the couple was so happy that they built a shed for the goats with their own materials. 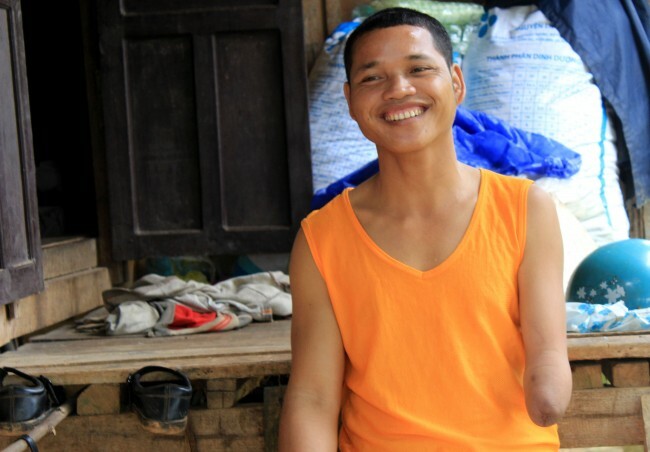 Losing left hand in 1985 due to a UXO explosion has not prevented Ho Uoc from being an optimistic person. As a boy at the age of eight, Uoc was tending water buffaloes for his uncle when a strange object attracted his curiosity. Not knowing that what it was, he picked it up and the item went off in his hand. Now married with four children, three girls and one boy, Uoc wishes that he could work more to help ease the burden for his wife and keep their children in school. 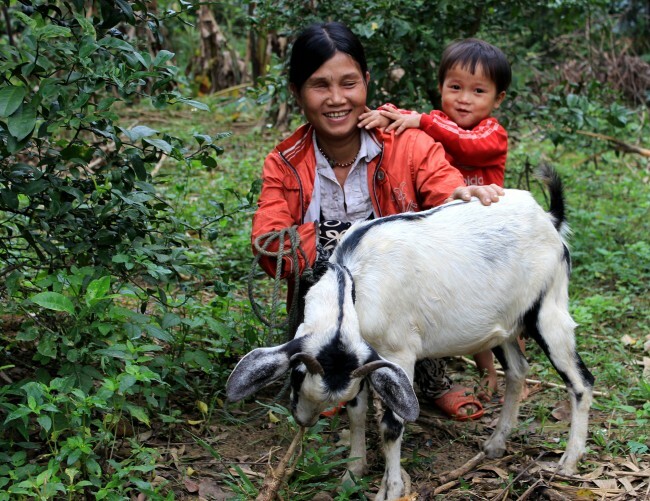 Uoc is encouraged that his family situation will be better now that they have two goats. He said he hoped they would be able to add more goats in the future. 40-year-old Ho Van Hung is a UXO survivor. In 2003, while working on a slash-and-burn plot, he found a wartime munition that he decided to sell for scrap. Unfortunately, the ordnance – which contained white phosphorous – exploded and caused serious burns to his entire body. Hung has two young children who haven’t started school yet. His wife tends a paddy rice field while Hung looks after other people’s water buffaloes to earn income. The family was very grateful to receive the two goats, which are the first livestock they have owned. The couple hoped that they could generate extra income from raising goats so that they could send their children to school when they reach school age. 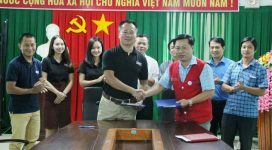 The 2015 donation from UP is part of the organization’s multiyear commitment to RENEW to provide cattle for ethnic minorities affected by UXO in Quang Tri Province. In 2013, seven UP members stayed in Dong Ha working on a one-week community service trip with Project RENEW staff. They saw firsthand how UXO-affected families were in need of assistance to improve their living conditions. Previous donations from UP helped to build a new and improved kitchen for blind people at a vocational workshop, so their meals could be cooked at their work place. UP also provided two breeding cows to two ethnic minority families. 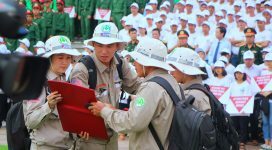 These contributions from members of UP have given new opportunities to families who are still affected by war consequences in Quang Tri, improving their lives and ensuring better futures for their children.